The story: Located in a three-storey Victorian townhouse in London, this kitchen from Harvey Jones incorporates individual touches such as tiled appliance housings, octagonal painted shapes on the wooden floor and herringbone tongue-and-groove detailing on the pitched ceiling. The kitchen was a complete rebuild of the ground floor with a glass roof and cabinetry handcrafted from American hardwood then painted in Farrow & Ball’s Strong White. The brief was that the kitchen should be a social space that worked on a family level during the day as well as a social level in the evening. Mr Philipson wanted a room designed for cooking, eating and hosting guests – a truly sociable space. To this end, an open plan space was selected with an island and colourful seating. It was also important that the craftsmanship of the kitchen sat alongside the period features so in this respect, the style of the Harvey Jones Shaker detailing worked perfectly while still allowing a contemporary feel for the modern space. I could see that it was very important to create a sense of flow in the space. Running the cabinetry along one wall and then introducing a skylight above the island really made the most of the space and meant that there were no visual obstacles between the entrance and the garden doors. The island creates a focal point and is somewhere to prep and cook that brings the whole room together, making the kitchen an inviting, sociable area. The classic Shaker-style of the cabinetry suits the house perfectly so that range was the ideal choice for this space. It looks fresh, light and clean and is complemented by the Compac Quartz worktops, which together create a stylish contrast to the dark bespoke tiled unit. The kitchen was a complete rebuild of the ground floor with a glass roof. The renovation was a complete overhaul of the three-storey house and the property hadn’t been touched since the 1960s. One of the challenges was to extend over the side return and a metre into the garden at the rear of the property to create a larger kitchen space. The contrast of the white cabinetry against the patterned bespoke floor and ceiling as well as the darker bespoke tiled unit, make the space feel really friendly and inviting. I also really like how much daylight streams through the skylight over the island, brightening up the whole kitchen. Installing the cabinetry along one side of the wall definitely allows the space to feel more open and allows for a feeling of flow through the scheme. When planning a kitchen you must always consider what your key requirements will be for you and also if you have a family. 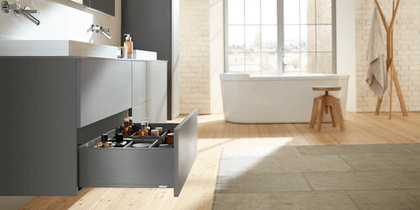 Do you want the kitchen to play a purely practical role or do you also want it to be a place to socialise? Secondly, you must look at the size – do you have enough room for an open plan design or will you need to consider a more compact formation. Hayley loves: the pops of colour in this otherwise crisp, clean white scheme.